When William Congreve wrote that “hell hath no fury like a woman scorned”, the woman he had in mind was probably Mother Nature. If you don’t speak pilot, here’s the decoded version. The airplane in question is a Cirrus SR22, a svelte, modern, composite design that’s taking the aviation world by storm. I fly these every day at work. They have tremendous performance for a general aviation aircraft, able to carry a significant load and climb at better than 1400 fpm while cruising at 180+ knots. But even an SR22 is no match for Mother Nature when she tries to turn you into an ice cube. One of the big attractions of the Cirrus is that they come with a safety device known as a Ballistic Recovery System. The BRS is essentially a parachute. The canopy is stored in the aft section of the fuselage, and when it’s activated, a rocket pulls the ‘chute out of the aircraft and frees straps built into the fuselage. The pilot shuts down the engine, and the entire aircraft descends to the ground at a slow enough speed to allow the occupants to walk away unharmed. 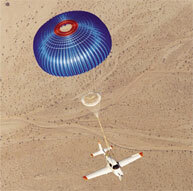 You can read about the parachute on the Cirrus site. Also, see a video clip of a BRS deployment here. I assume the PIREP was submitted by a controller and not the pilot, as he was undoubtedly busy trying not to soil himself. Not to make light of the situation, but it would have been sort of funny if the pilot had deployed the ballistic recovery system and then casually asked ATC if he could change radio frequencies to submit a weather observation to Flight Watch. I imagine that even without the PIREP there was a lot of confusion on that frequency. You’re doing what?